Niklas Angmyr’s (@Nilkas_Angmyr) model of Competence – Ability – Performance is interesting by itself and also in relation to my Multi-layer Learning. (His model is described in detail in Swedish on Niklas’ blog http://www.palorial.se/inkurans-och-avskrivning-av-kompetens/) Below is my expanded version of his model. Some key notions or starting points of mine; Knowledge cannot be stored. It’s more of a cracked pot that needs continuous watering for the plant of competence to grow. Competence is seen as knowing how to put one’s knowledge into fruition and Ability is to actually DO something with the knowledge and Performance is when you analyze the result. From my point of view learning occurs continuously when performing ones job but most of it is lost since there aren’t any routines or strategies to utilize and take advantage of it. 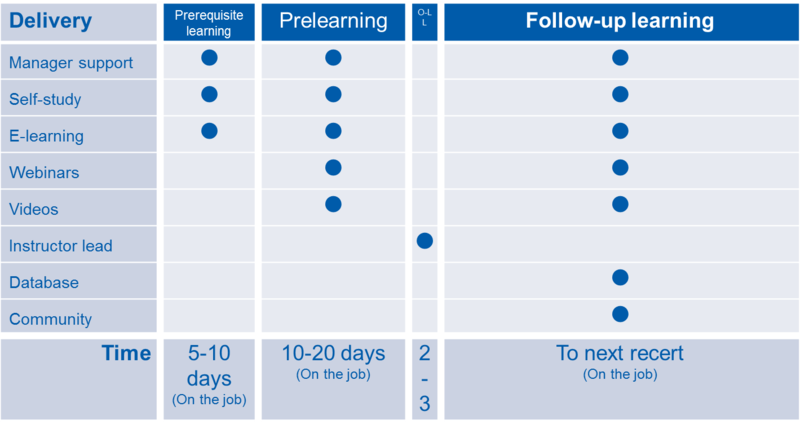 With better processes and support this learning could be milked or absorbed from when you interpret, perform and view the result of your work activity. This, along with measuring of the final performance (was the result good or bad?) you’re given an opportunity and possibility to Reflect and Share this with your colleagues. All in all, this is a way to increase the continuously drying out of competence. It’s a way of watering the cracked pot of knowledge. After sharing my last post via twitter I got some feedback from the very much knowledgeable, competent and able Jane Hart (@C4LPT) and Charles Jennings (@charlesjennings). The model Multi-layer Learning is, of course a way of organizing learning for people but it doesn’t prevent work-based learning or leave out sharing of knowledge. That is part of how you deliver the learning and in the model most significantly shown in the delivery layers Database and Community. However, I do agree that we L&D people are way too hot on delivering training/learning and often leaves continuous sharing/spreading of the new found knowledge out of the equation. Harold Jarche (@hjarche) has some strong opinions about this when he says (my summary) that simple problems should be put into a database and not be part of any training/learning. Hard problems should be solved, broken down into their smallest elements and THEN be put into the same database. If done right, we don’t need any L&D departments at all.